With welcoming entrances from both the Academic Quad and Oak Drive, the 18,500-square-foot building allows Colgate to provide seamless postgraduate exploration and planning by bringing together Career Services, the Office of National Fellowships and Scholarships, and the Thought Into Action entrepreneurship program’s administrative office under one roof. Benton Hall features suites for advising, employer relations, and interviews; reception areas; and administrative offices. With flexible public areas such as a large career commons and a seminar room, it serves as a hub for networking events, information sessions, and entrepreneur team workshops — as well as academic classes, seminars, lectures, exhibitions, and performances. 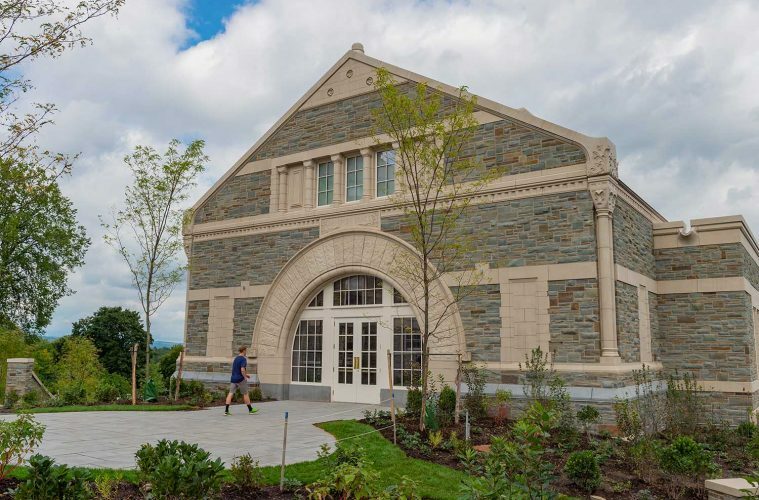 The $16.4 million, 100 percent donor-funded building, which is named for Colgate Trustee Daniel C. Benton ’80, P’10, H’10, was designed by R.M. Stern Architects, adhering to LEED Platinum sustainability standards. Romanesque exterior touches reflect architectural features from both Hascall and James B. Colgate halls. For his part, Chair of the Board of Trustees Daniel B. Hurwitz ’86, P’17, P’20 trumpeted the impact that Benton has had on Colgate, most recently with the leadership gift that made Benton Hall possible.